And yes, organizations find their claims data reveals that, similar to many companies in America, the chronic diseases of heart disease, cancer, stroke, diabetes, and arthritis resulting from the common health-damaging, but modifiable behaviors—tobacco use, insufficient physical activity, poor eating habits, and excessive alcohol use (Centers for Disease Control and Prevention, 2009)—are responsible for high cost claims. So if this is the case, why have traditional efforts not had the desired outcomes of better health and changed behavior? Perhaps the focus needs to move beyond biometrics and shift from being only on the disease to addressing the factors that influence people’s behaviors. According to the CDC, population health outcomes are significantly influenced by complex, integrated and overlapping social structures and economic systems referred to as Social Determinants of Health (SDH) (Centers for Disease Control and Prevention., April 2009). This perspective supports a Holistic Model of Wellness which will move past biometrics to address behavior with a more comprehensive approach. A Holistic Model is defined as a concept upholding that all aspects of people’s needs including: – psychological – physical – social – spiritual should be taken into account and seen as a whole when addressing health. 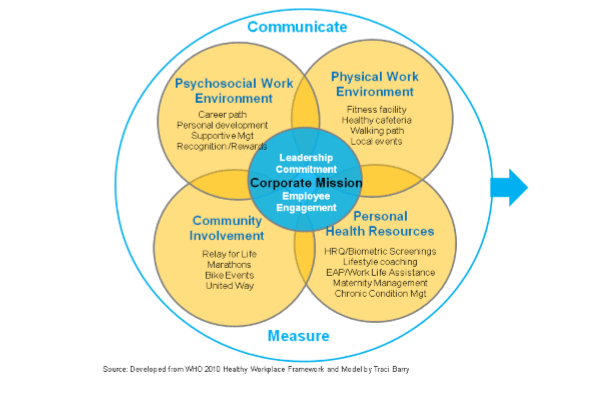 Employers can take strides to create a culture of health which supports the risk reduction and, ultimately, the overall health of the population by turning attention to a model such as the World Health Organization’s 2010 Healthy Workplace Framework and Model. The WHO healthy workplace model: a comprehensive way of thinking and acting that addresses: work-related physical and psychosocial risks; promotion and support of healthy behaviors; and broader social and environmental determinants (World Health Organization, 2013). WHO promotes creating workplaces that are healthy for employees and that prevent illness and disease, as one way in which companies can meet rising expectations, while also improving productivity and competitiveness (World Health Organization, 2013). The focus needs to move beyond biometrics and shift from being only on the disease to addressing the factors that influence peoples behaviors. When creating and adjusting strategic plans for health management, employers can find increasing returns on their investments of time and resources by moving beyond biometrics whereby incorporating current initiatives into a bigger picture to improve worker health and the culture within their organizations.